Is there a fission physicist in the house? I realize Chernobyl (graphite pile) and Fukushima (boiling water with metal containment vessel) are different technologies, but both had meltdowns, and both contain tons of melted nuclear fuel that no one knows how to remove (let alone "clean up"). Chernobyl avoided the "China Syndrome" by luck. Sand placed around the plant when it was constructed slipped into the basement as a result of an explosion. As the fuel melted down, it mixed with the sand, which vitrified it, and diluted it out of criticality. It's still very hot (in a radioactive sense) but it's no longer molten. An ice tunnel (to create a barrier between the core and ground water) was started, but not completed. In Fukushima there are three molten cores -- and no sand. Apparently they are kept from melting into ground water (or from further melting into ground water) by being constantly cooled by water hosed in. The result is a lot of contaminated water being stored in an ever-growing number of tanks. Fukushima also plans an ice tunnel. 1. The cores are still "hot" enough (radioactively) to fry purpose-built robots (as of March 2016). Doesn't that imply ongoing criticality? What is the status of short-life daughter products (iodine, Xenon) that signify criticality? 2. Doesn't the plan for the ice tunnel also signify ongoing criticality? 3. Is the purpose of the water cooling to draw away heat to prevent the China Syndrome? Presumably the water does not "cool" the chain reaction. Could the water even be acting as a moderator that increases the amount of fission? -- the radiation is low because a lot of weeds and surface soil were removed. Might not hot spots remain? -- If no longer cooled with water couldn't the cores melt into the ground (potentially releasing radioactive steam), or generate hydrogen that might cause another radiation-spreading explosion? Fukushima is a classic "Cat in the Hat" problem. Try to rub out a pink stain, and you just spread it. I don't like some of the alarmist stuff written about Fukushima (like blaming it for USA West Coast starfish die-offs, which appears to be pure speculation); but the situation does seems justifiably terrifying -- and not being discussed hardly anywhere. My guess is most of the current radioactivity from those reactors is from isotopes with half lives measured in years to decades. Fukushima went non-critical very quickly when the quake hit and control rods were inserted. But residual radioactivity required continuing coolant flow to avoid a melt down, which was powered by diesel backup generators until the tsunami came =over= the sea wall and flooded the diesel generators. One character for newer "passively safe" reactor designs is you can deal with loss of coolant by just shutting them down and the reactor won't melt down. Of course this is all theory, as getting the new safer designs certified for construction is a pain. Fukushima went non-critical very quickly when the quake hit and control rods were inserted. and the radiation is so high it's killing purpose built (presumably radiation hardened) robots. I am not a physicist (or scientist, for that matter), but doesn't the high radiation now (5 years after the accident) signify very high levels of fission? Doesn't that signify it is critical still or could become so? Chernobyl was diluted by sand -- stopping criticality there. But that doesn't apply at Fukushima. Even once you shut down a core, it still has residual heat as the daughter products burn off. Without cooling, this would cause heatup, and eventually possible damage. The first damage is normally when you have boiling around the fuel assemblies, which are zirconium alloy, and they don't like oxygen. When hot, and exposed to oxygen, this generates hydrogen. This was the mode of failure at Fukushima. The resulting H2 buildups, and inadequate venting, created explosion conditions. Pop, plant done. One of the blasts was actually H2 that was inadvertantly vented from the reactor next door, due to the venting and ventilation system designs. In any event, criticality is a function of mass and geometry. When a core has catastrophic failure, where the fuel assemblies are breached, then geometry is now in the hands of fate. Once active melting occurs, creating what is known as corium (I prefer core slag), then both mass and geometry are in the hands of fate. Typically, with redundant cooling designs, the slag ball will remain within the core vessel. However, with inadequate cooling, the slag ball can (and has in the case of Fukushima) breach the container vessel. Then you are at the next stage of containment, which in the designs being discussed is the containment vessel support structure (Reinforced concrete). This was also breached, (hot corium will eat concrete as well) in at least two (as I understand) of the Fukushima cores. Now you are at the next stage of containment for the design, which is the cooling well structure. This is purposely designed to 'catch' the corium, and is essentially a big tub you can pour water and corium into in this design. If this fails (like say due to fracturing from a Hydrogen pop), then you are at the last containment, which is the foundational substructure, concrete, and lots of it, like meters thick. It is really unlikely that the corium slag will retain enough mass and geometry by this point to continue to cook off and eat concrete. Each time the slag ball eats something it is dispersed and diluted to some degree, in effect leaving a debris trail as it eats its way down. In mods, sims, and live testing, the slag ball runs out of mass and geometry eventually, and this is how the containment layering are designed. If you add cooling in some form, you can be self defeating to the point of creating a slag ball, with a hard crust and molten center, that retains mass and geometry for fission. The best way to stop the reaction, is to pop the ball, disperse the mass, and disrupt the geometry. If you can do this and cool it, you will end it fast. They do know "where" the slag balls are in Fukushima, just not to the millimeter. Some of what you are picking up on is hype reporting, that is overlooking fundamental facts. I would recommend you read the entire IAEA report on the accident, you might find it enlightening. If you are really curious, I would recommend looking up core failure studies that have been done, there are a few, and they will also help your understanding. I was at INEL when they did the physical analysis of the TMI-2 core (deflated slag ball). It was very informative. Shutting the core down means inserting control rods. But is that not irrelevant in connection with Fukushima -- where the fuel is now lying in molten piles? The core is radioactive enough to kill robots... and hot enough (in degrees and in radioactivity) to damage the concrete below the steel core catcher (is that right?) but maybe not hot enough to melt through the concrete. Doesn't that signify more than "residual" heat? I think I understand the geometry point (the same mass spread out has less fission going on than a sphere), but why isn't the mass sufficient to stay critical? Unlike Chernobyl (diluted by sand) there's little dilution here (except perhaps from the fuel rod rubble, the steel containment, and the cement itself). Great post that hopefully will be read by as lot of people looking for solid information about this topic. Most media outlets feed on the hyperbole and panic these days and thus people are scared and uninformed about the topic. Corium (slag) is a mix of core component materials, which includes everything. This includes control rods. Control rods function primarily in conjunction with geometry. Inserting control rods changes the core's perceived fission geometry by making it seem bigger and less dense. This is accomplished by the shape of the rods, and placing them between fuel assembly structures and them absorbing neutrons. When the fuel assemblies melt, they melt the supporting structure around them as well, this includes the control rods. The slag will form a shape that periodically will create a crusting, which will then fail and 'leak' molten slag into a new puddle/ball, and repeat as it can. There are no more cores at Fukushima, there are slags that contain fuel mass and assorted other core materials. If there is sufficient fuel mass and geometry, it will be highly active and hot, even self sustaining (or critical). This may produce enough radiation to smoke a robot, however, the robot would need to be a.) pretty darn close as it is a cube function and b.) fairly fragile. I suspect some other failure mode for the robot(s), such as heat, steam, or corrosive environment effects. Yes, corium is right handy at eating concrete as long as it maintains mass and geometry for ongoing fission. It is a mostly function of high energy particle embrittlement and heat in regards to its ability to 'eat' through substances. There are some other factors regarding chemistry, but as I recall, the primary mode is due to particles and heat. See above, we are talking about sustained reactions and enough heat to slag metals into an aggregate mass. If the mass retains sufficient fuel density and geometry, it will sustain fission (be critical). If, as it 'slags' around and down, loses sufficient mass and/or geometry, it will not retain criticality, thus stop generating real heat, and start to cool. Any heat left at this point is due to decay products, and sub-critical burn off of fuel remnants (which may take a long while). It could also be that the corium mass becomes split, or has uneven mixing, which may mean that 'hot spots' are incongruous throughout the mass, as high concentration areas retain sufficient mass/geometry to continue cooking off, but at lower energy output levels. This is all about the neutrons. Each (0n1)s can make on average 2 or so new (0n1)s per reaction. So as long as there are enough targets (fuel nuclei) that are reachable by the generated neutrons to collide with, you will make enough (0n1)s to keep it rolling. Now, to be clear, I am not differentiating between fast and slow (0n1)s as to make the point I am making, that is complexity that is not required. I believe you are referring to the ICE DAM the have constructed around the reactors. As Ladajo stated one of the cores has likely leaked contaminates past the containment. But according to the report I have read this was not due to a burn though but a crack in the foundation structure allowing contaminated cooling water to leak into the ground water headed toward the ocean. The ice dam surround the reactors freezing the soil and water in place to keep the "bad" stuff from mixing the water table. The soil/water is frozen down to bedrock and prevents the spread of the used cooling water to the local environment. The wall was fully operational this febuary (better late than never)and is a sound tested method of preventing water migration use often in heavy construction. Side note: One IAEA report mentions if the original placement of the backup generators would have been followed( placed on the hill instead of in "water tight containers") this would have been know as the controlled shutdown of the Fukushima reactor and forgotten by now. Can any one name the other four nuclear power plants that were shut down in a controlled manner due to the tsunami and flooding? Last edited by paperburn1 on Tue Mar 22, 2016 10:14 pm, edited 1 time in total. Thanks to you (and all) for patient and detailed answers! And for the links, which I will read. Still... a scary situation. Even if the slags are unlikely to melt into the ground water, they were (are?) hot enough to threaten it indirectly (by cracking the cement part of the containment). Apparently, one way to determine whether seemingly vintage wine is fake (falsely claimed be bottled before WWII) is by detecting trace radioactive isotopes which were not present pre-Hiroshima. I don't know if such contamination originating from Fukushima has serious implications for Japan or anywhere, but I think I will avoid bottled Fukushima spring water. I beleive the crack was blamed on an H2 pop in the donut. It was not due to the slag. Can any one name the other four nuclear power plants that were shut down in a controlled manner due to the tsunami and flooding that day? ladajo wrote: I beleive the crack was blamed on an H2 pop in the donut. Nope. The only explosions were those created by H2 generated from heat and exposure of zircaloy fuel matrix cladding to oxygen. This is a prime threat from loss of cooling. For example, it is still not really understood why TMI-2 did not hydrogen pop. It, apparently, was well enough vented (containment safety releases) to prevent sufficient build up from existing for explosive levels. I am not sure why you are seemingly fixated on the word "critical". It only means that a core is producing enough neutrons to sustain its operating power level; balanced or K-eff = 1.0. Sub-critical means that it is losing power, super-critical means raising power. Plants operate across these regimes all the time. Fission product burn-off is the primary heat source once shutdown. If the core smokes itself, and melts, then you are into a new operating regime based on the new mass/geometry construct of the 'corium' slag. Typically, it is mostly impacted by gravity (denser materials stay lower), and chemistry, where the component materials create new ones as they mix under heat. Primarily, this is why the uranium-oxide component is created. Fortunately, a standard power plant can not create on its own sufficient mass/geometry/isotope (U-238) to create a fast-fission core (bomb). So you are left with a peak power construct in the corium based on fuel density and geometry. This will not lead to a boom. The H2 is all done by that point, and all you have left really is the potential for steam explosions as attempts to cool may become confined in an adhoc 'pressure vessel' that can't take the load. Prompt criticality is where the core experiences as rapid increase in reactivity addition rate, such as the simultaneous ejection of all control rods, or a cold water injection accident, which in turn creates a plethora of Prompt (0n1)s (the ones coming directly from fuel fission, not products - which are known as Delayed), which in turn become sufficiently dense to take primary control of reactivity in the core, leading to power rates based on the Prompt generation cycle (ie. your power rockets up really friggin fast). The net outcome is slag, more than likely preceded by an H2 pop, and possibly a steam pop. Spent fuel does not normally contain enough juice to support an H2 pop, also, the structure of cooling pool racks provide much more separation (less density/poor geometry) then when the rods are in the core (this is on purpose). They can create enough heat to generate H2, if the pool boils, and/or drains, but this is dependent on how long/old the spent fuel is, and how long it has been soaking. Fuel pools are at atmospheric pressure, and vented to the open. They are literally pools with open tops as you see in the video, and any gas like H2 is going to rise out, not accumulate in as he suggests. H2 would disperse up into the containment building, which would then be vented to the outside. I suppose in dire conditions, that non-vented building might accumulate enough H2 to pop from a spent fuel pool. Once it got a hole in it, not going to happen again. As I recall, the explosion in Unit 3 was H2 that was confined in the upper containment from primary venting. It then ignited, and made for a very large concrete casing/H2 fueled firecracker. Unit 1's pop was in the drywell & donut as I recall. The blast Gunderson is playing talking head for was an H2 pop, you can't make a bomb out of U-235 fuel assemblies, the density, geometry, enrichment, and slow fuel isotope (U-235) makes it all wrong: Read the IAEA report, it explains the H2 blasts. 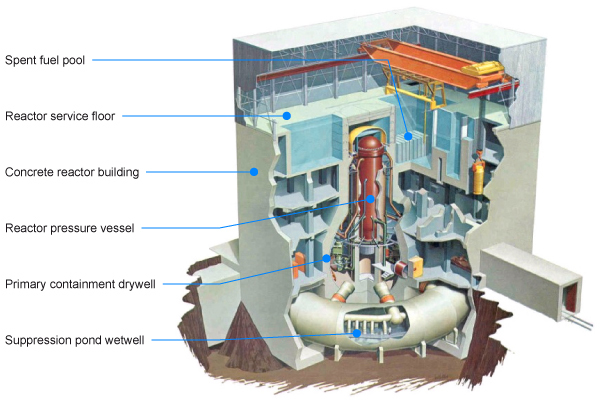 Unit 1 had a build up in the secondary containment (pressure vessel is the primary), at that is why the blast looked different, it had to find a way out of the structure. Unit 3, had a build up in the upper containment, and it took the top off the structure. Unit 4 was cross fed H2 from Unit 3 via the venting system. More detailed explanations for me to ponder - thx! Interesting that Arne Gundersen's speculation about criticality may have been wrong. I know the first two examples involve Pu (not U235 or MOX) and the third example is Hollywood (and maybe no one else thinks it depicts criticality). Still... magic time! Exceed the criticality threshold and whammo! radioactivity so high no one and no machine can get near it. Get enough of the right stuff in a pile and it's wayyyyyyyyyy more dangerous than the same stuff in smaller piles. It's what makes nuclear reactions different in kind than chemical ones. And what makes fission scary: no off switch! If I understand correctly, Chernobyl slag (the "elephant foot") is sub-critical, but still too deadly for man or machine to approach -- hence the plan to contain. Maybe Fukushima is more like that than I realized. Except Chernobyl seems stable -- no cooling water needed. What would happen at Fukushima if the water was turned off? My fantasy is Japan uses robots to dump sand doped with boron onto the Fukushima cores, and then the cooling water is turned off. I would imagine the cores would melt and flow again, but would be diluted by sand -- vitrifying and (thanks to boron) becoming less reactive.